Delight your loved ones with this Cherished Bouquet of One Dozen Gorgeous Carnations and make them realize how special they mean to you. Dozen Carnations Arrangement with Cadburys Celebration pack. 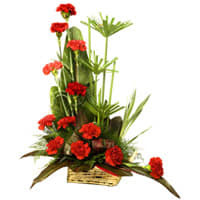 Dozen Carnations Arrangement with 500grms Assorted Sweets. Dozen Carnations Arrangement 16 pcs Ferrero Rocher chocolate box.